And, yes, it’s still tied. Magnus Carlsen of Norway, the three-time defending world champion and world No. 1, began the game by pushing the white pawn in front of his left bishop to the c4 square — a relatively rare move at the game’s highest levels. Fabiano Caruana, the U.S. challenger and world No. 2 trying to become the first American world champion since Bobby Fischer in 1972, pushed a black pawn to e5. And with that, the English had come. Few bells would be rung for the rest of the game. Game 4 ended in a draw, just as the three previous games had. It was an uninspired 34-move, 2.5-hour episode. The match for the game’s highest prize remains level, at 2 points apiece in a race to 6.5.1 The boring result failed to overshadow the real drama of the day: the Zapruder film of this world championship. The pattern of pieces that developed on the board is called, rather delightfully, a “Reverse Dragon.” The Sicilian Defence has a variation called the Dragon — named after the resemblance of the pawns to the constellation Draco — except in this case its colors were reversed. But the position breathed no fire on Tuesday. After 10 moves, the game was an exact match of a game that Caruana played against Wesley So, another top American grandmaster, earlier this year — the only such game that had ever featured this position, according to ChessBase. Given how recent and high-profile it was, this was a game that Caruana and Carlsen almost certainly both remembered well. After that, the two entered previously unseen territory. But the uncharted wilderness did not provide much in the way of excitement. 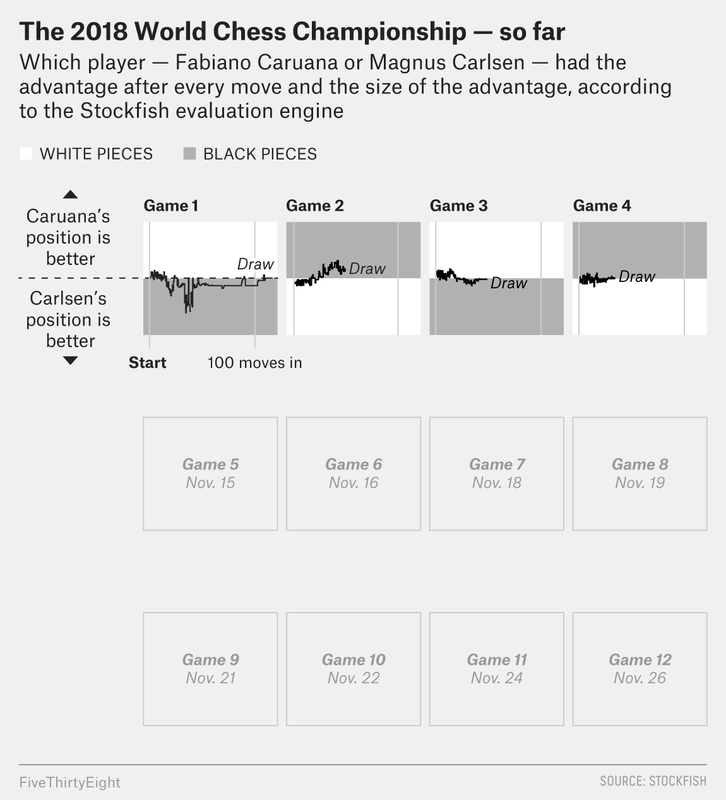 Carlsen and Caruana agreed to a draw after 34 moves, in the position below. Despite the many pieces on the board, the grandmasters’ expertise told them that there was only one way this was likely to go. Here’s how things have gone on the chessboard thus far, and we’ll keep the chart below updated throughout the match. The day’s humdrum play was overshadowed by some excitement off the board, though. A chess-world controversy — or at least what qualifies as one — erupted. 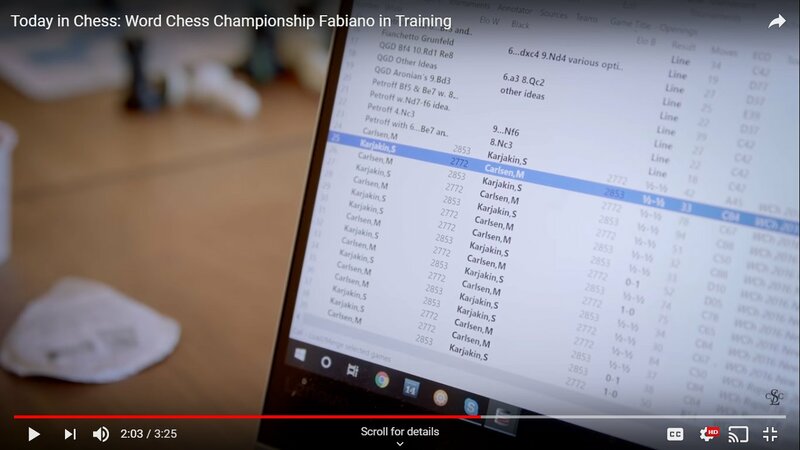 Before the game, the posh Saint Louis Chess Club posted, and quickly deleted, a YouTube video appearing to show aspects of Caruana’s pre-championship preparation sessions. The club is Caruana’s de facto office and was founded by the billionaire retired financier Rex Sinquefield, who also helps fund Caruana’s chess career — both the club and Caruana are totems of Sinquefield’s deep pockets and deep love of chess. A chess columnist named John Hartmann tweeted this screenshot from the video. It shows a laptop screen, complete with chess ideas in progress — a “Fianchetto Grunfeld,” various Queen’s Gambits Declined (an opening that was played in Game 2), and a number of ideas related to the favorite Petroff. It also shows a number of games from the 2016 world championship, to which Caruana was surely paying close attention. A clip of the video, as first posted to Twitter by the chess writer Olimpiu Urcan, shows Caruana leafing through a book of Carlsen’s past championship games and then handing it across a chessboard to his grandmaster coach and “second,” Rustam Kasimdzhanov, while grandmaster Alejandro Ramírez sits nearby. Some chess commentators suggested that it was a huge blunder; others suggested that it was a deft piece of a disinformation campaign. The Saint Louis Chess Club did not respond to my emailed requests for comment, and Caruana’s manager declined to comment. Caruana himself declined to comment at a post-game news conference, and Carlsen claimed that he hadn’t seen it but was aware of its existence. World Chess Championship preparation is always closely guarded. Kasimdzhanov warned me last spring that anything I might write about Caruana’s prep would be pored over by his Norwegian opponent and his team of hired chess guns for any shred of usable information. A player readying for a championship match typically enters seclusion with a small, handpicked crew of grandmaster aides and other associates. Even revealing their identities could be risky, I was told, because different grandmasters have different chess tendencies, and revealing the grandmasters might signal a game plan to the opponent. When Fischer was readying for his championship match, at a resort in upstate New York where prizefighters trained, he told an interloping New York Times reporter to “shove off” and stopped answering the phone. In April, FiveThirtyEight was promised access to Caruana’s training camp by Caruana’s managers — a promise that was rescinded in July. That change of heart was not unique to this website. At least one other major online outlet was promised exclusive access to his training camps — another promise that was rescinded in July. But the players will have to play their moves in public eventually. Perhaps one of them will even win a game of chess. The match rests on Wednesday, but Game 5 begins Thursday at 3 p.m. Greenwich Mean Time — that’s 10 a.m. Eastern. I’ll be covering it here and on Twitter. Wins are worth 1, draws 0.5 and losses 0.